This is the third post in the series on the condition and layout of the property at time of purchase. 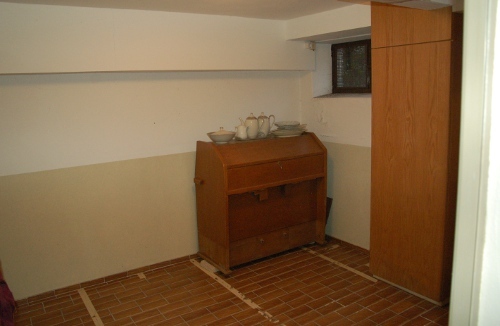 This basement, like one would expect, is a bit less fun to look at than, say, the main worship hall. I’m going to focus a bit on the practical aspects of heating and other necessities. It’s probably going to be pretty clear here that I really don’t know anything about heating systems and the like (but I’m learning). Back home, cooling was far more a concern than heating, and climate control was via air ducts. I’ve never lived anywhere with oil heating. I only encountered radiators upon coming to Europe, and most of the time those were run on district heat. Whatever I know about house construction I learned by watching This Old House on PBS as a kid. But that means what I know is more than 20 years out of date, and also pretty USA specific. House construction is quite different here in Germany and the local regulations for energy efficiency are much much more stringent and prescriptive. I’ll again start with the floor plan. There’s a hallway and a five rooms on the left side of the house. The main hall sits above a crawlspace. Floor plan for the basement level. Click to enlarge. After the jump, we’ll have the photo tour. 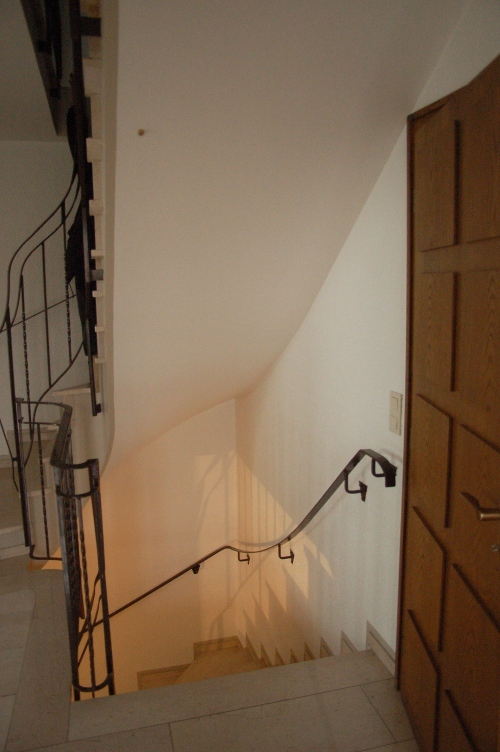 First, down the stairs from the ground floor to the basement. The nice stone continues in the hall are down there. (Ignore the pile of junk which has been removed since the photo was taken). Under the stairs in the basement. 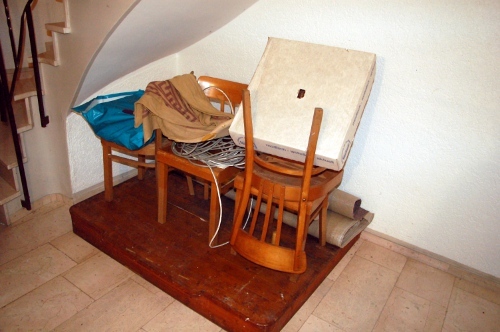 The point of this photo is not the pile of stuff, but rather the floor and the shape of the space. 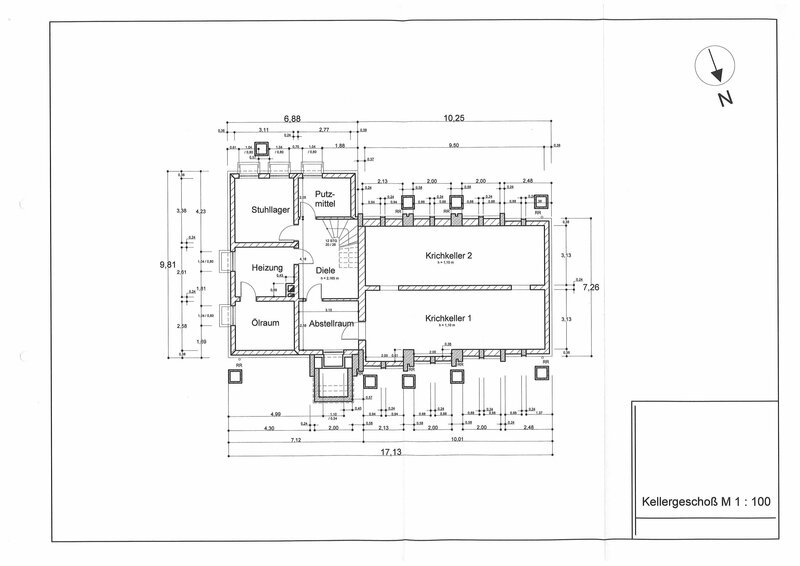 The first room is what will be the laundry room (labeled “Putzmittel” on the plans). It’s got a window to the outside world (single-glazed), a drain in the floor, and some serviceable and solid tiles. We’ll need to install a washing machine connection. 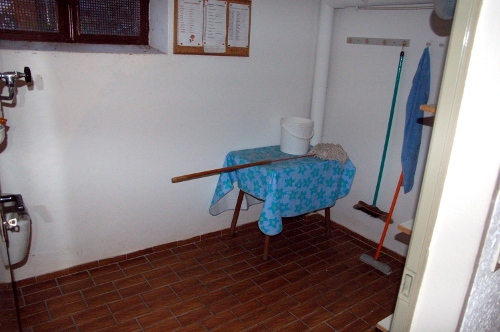 There’s also a janitor’s basin. And yes, maybe I wasn’t totally accurate when I said there’s no hot water in the building. We do have this antiquated looking electric boiler that provides a bit of warm water for this one sink. 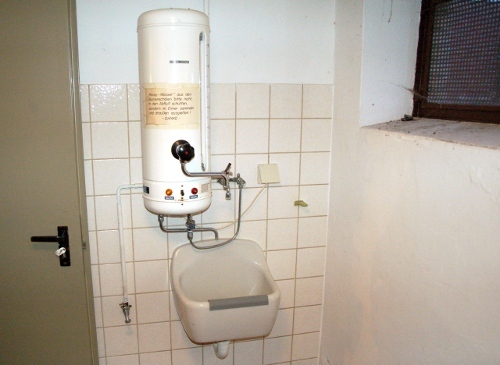 Laundry room janitor's basin and small electric boiler. The next room counts as habitable since it’s got a radiator. This will probably be storage. The stripes on the tiles were used to secure carpet. Now we get to the really practical bits. The lovely blue box is a relatively new, energy-efficient, oil-fired, cast-iron heating kettle. 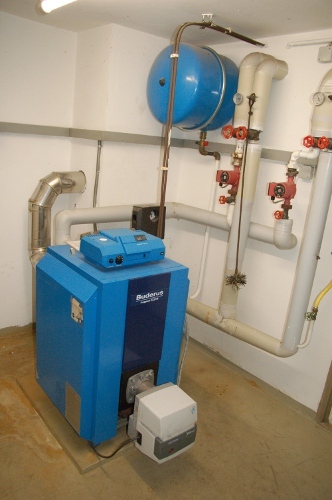 Water is heated in this blue monster using the oil in the next room, and is sent to the radiators in the building in two separate circuits. One circuit goes to the main hall, the other to the rest of the building. This two circuit set up makes my wild and unconstrained desires for underfloor heating in the main hall easier to implement. The monster heating kettle. The two heating circuits and pump are clearly visible. 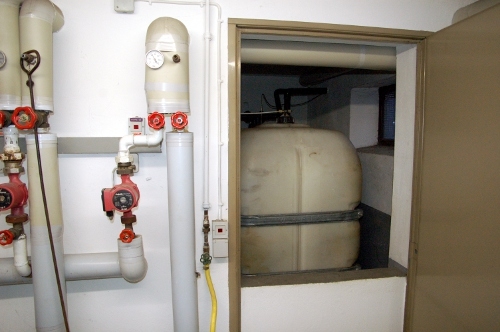 A peek into the room with the oil tanks. The next room has the fresh water set up. I have no idea what those things are in the picture, or why they are needed. Looks like a meter and some rope, a filter and some gloves, something for pressure(??) which needs to be plugged in (??). I’m guessing the plastic canister is for overflow on the presumed pressure regulator? Dunno. Fresh water installation. Right now, I don't know wtf most of this is. 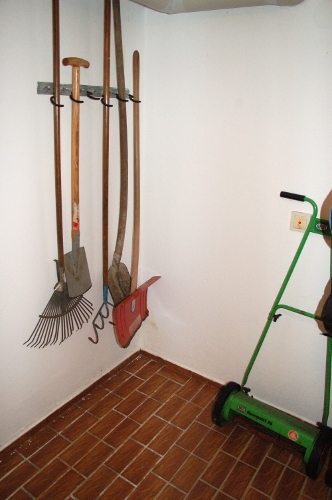 Next we have some garden implements that the church was very kind to leave us. 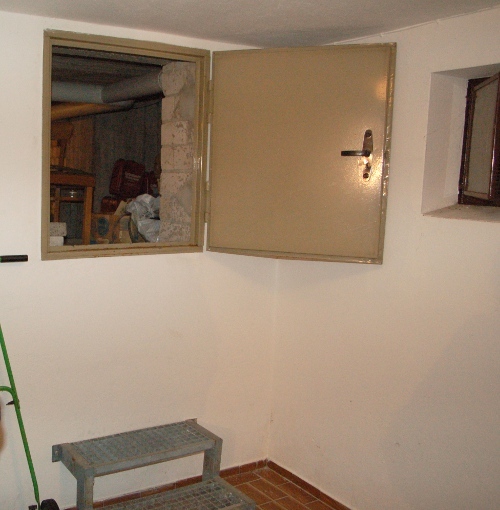 Then we can take a look at the crawlspace (ignore the crap in there – it’s been since removed). This crawl space is going to make getting hot water and sewage to the kitchen area much less complicated. We will need to insulate the main hall floor, and that’s probably easier done from this side. 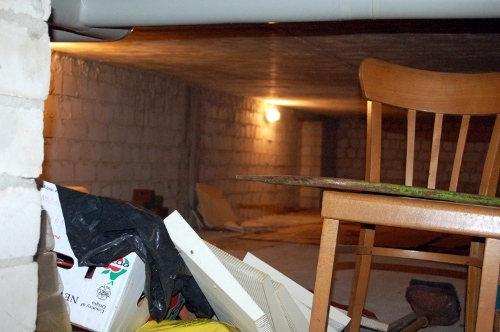 If you look past the crap, you can see the central dividing wall in the crawlspace. This will be important for any potential lofted space in the main hall. The last post in this series, covering the garden, will be delayed a few weeks. We’re not going to do anything with the garden anytime soon. I’d like to focus on things that are more pressing, like making it possible to bathe and cook in the house. So, Friday we’ll take a look at our rough plans for using the space in the house. I’m still totally amazed by this place. That is a lot of space downstairs. But you have some serious work cut out for you! I’ve learned what those things are in the water delivery system. 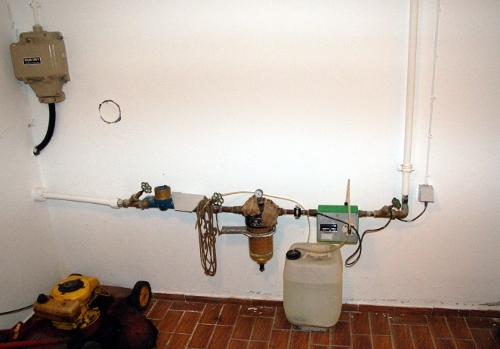 From left to right: water meter, filter, water softening system. In particular, the liquid in the canister in not water, but rather a chemical for softening the water. There is suspiciously much of this substance after so much time, so it might not be functioning. Will need to have that looked at.